Large 2.5 feet bean bag chair in limo black. Measuring 76cm x 76cm x 76cm, with a recommended floor space of 80cm x 80cm. Designed with 1 inner layer containing an ultra-soft polyester foam mix, and 1 removable & washable outer cover to allow for easy maintenance. High quality virgin foam which is filled to support children of all sizes, teens and small adults. No foam refilling is necessary. Double stitched finishing for maximum strength with strong outer cover zipper. Each bean bag sack goes through a rigorous testing process before being shipped. Sit back and relax into a seat which will instantly form to your body shape to help hold and support you. Perfect for a living room, bedroom, basement, playroom, dorm or study area. 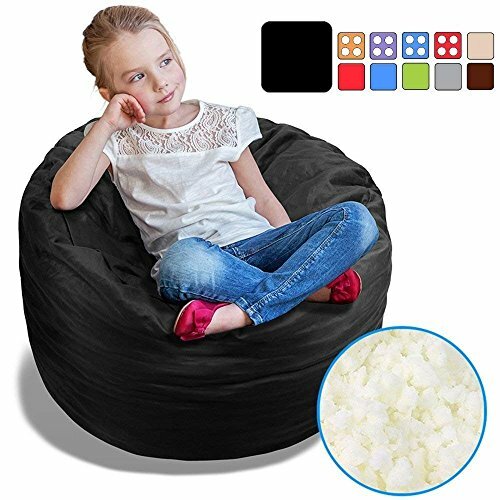 BEAN BAG CHAIR: Large 2.5 feet bean bag chair in limo black. Measuring 76cm x 76cm x 76cm, with a recommended floor space of 80cm x 80cm. DOUBLE LAYERED: Designed with 1 inner layer containing an ultra-soft polyester foam mix, and 1 removable & washable outer cover to allow for easy maintenance. LONG LASTING FOAM: High quality virgin foam which is filled to support children of all sizes, teens and small adults. No foam refilling is necessary. ATTENTION TO DETAIL: Double stitched finishing for maximum strength with strong outer cover zipper. Each bean bag sack goes through a rigorous testing process before being shipped. ULTIMATE COMFORT: Sit back and relax into a seat which will instantly form to your body shape to help hold and support you. Perfect for a living room, bedroom, basement, playroom, dorm or study area. Delmach Stuffed Animal Bean Bag | 100% COTTON CANVAS (Red) | PREMIUM QUALITY GUARANTEED | Storage Bean Bag Cover | Cool Kids Chair | For Room Organization | Toy Holder | EXTRA LARGE 38"